Born in September 1976, Markus Roth’s passion for photography reaches all the way back to his childhood. The son of the well-known sports photographer Hans-Alfred Roth has learned in his early childhood how fascinating it is to captivate special moments on film or memory chip. He has been addicted to the underwater world since 2004. Thus, next to his wife, Judith; his camera has been his constant companion. Apart from local waters, the main international dive sites Markus Roth has visited on several occasions are the Maldives, Negros, Bohol and Anilao in the Philippines, Lembeh Strait, Bangka and Bunaken in North Sulawesi, Weda Bay, Sali Bay and Pulau Rao in Halmahera, Ambon, Saparua in the Malukku Islands, the Jewels of Indonesia, Cenderawasih Bay, Triton Bay, Manokwari, Biak & Raja Ampat in West Papua. He really likes extraordinary remote places like Cenderawasih Bay, Triton Bay or Weda Bay. Being the first diver at a reef has become an obsession for him. His pictures and articles have been published in magazines and newspapers world wide. Just to name a few: TAUCHEN, UNTERWASSER, SCUBA DIVING, EZ-Dive Magazine, Asian Diver, Diver, Sport Diving (Australia), Dive Pacific, DIVE THE WORLD, Buddy Potapeni, Niugini Blue, Divemaster, Wielki Blekit, Natures Playground, The Dive Site, Silent World and Geolino. 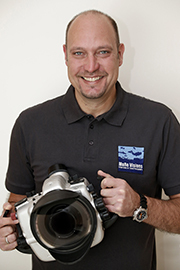 He was Photographer of the week at Dive Photo Guide and has also been invited to speak on various marine related themes at the International Boat Show „BOOT“ in Düsseldorf, the Diving Resort & Travel Expo (DRT) in Hong Kong and ADEX in Singapore. Besides that he is a regular workshop leader during the „Tag der Unterwasser Fotografie“ run by SEACAM and UWF.